“The Iranian weapons ship reached Israel last night. The operation to seize the ship had two goals: Preventing the delivery of deadly weapons to terrorist organizations in the Gaza Strip, which would have directly endangered Israel’s citizens, and exposing the true face of Iran, which was behind this weapons shipment . Iran completely denies its involvement; it is lying in the most brazen manner. We will present evidence of this tomorrow and later. President Shimon Peres’ at the seat of the parliament in Strasbourg. I stand here before you, burning memories in my heart, great hopes in my soul.I carry profound pain concerning the past. And look with confident eyes to the future. I immigrated to Israel in 1934, at the age of 11. In 1942, most of the inhabitants of my town were burned alive. Had my family delayed their emigration by 8 years, we would have been exterminated. A year before the creation of Israel, in 1947, I was recruited to the Haganah headquarters. Since then, Israel has been attacked seven times in its 65 years of existence. We were outmanned and outgunned. The choice was to win or to die. I participated as well in confronting another enemy – the desert. We won. We made it bloom. No other people experienced anything similar. I have my memories, but I carry my dreams. I did not come to reminisce, but to continue to dream. People age. Dreams are ageless. We changed. Europe changed. I came to express our admiration for the changed Europe. Europe picked itself up in the wake of the worst of world wars. It divorced its past, it created a new Europe. You converted the divided Europe of the last thousand years, to the united Europe of today. You replaced military camps with scientific campuses. Europe which knew racism now considers it a crime. I know that you are facing an economic crisis, but your skies are without clouds of war. A European country introduced the Nobel Prize. And now a united Europe won it rightly. Europe corrected its mistakes and is building a better world. For us, the Europe of the Shoah is becoming a Europe supporting our renaissance. Friends, the idea of the rebirth of Israel was born on European soil. In the past thousand years, more Jews lived in Europe than in any other continent. Alas, more Jews were murdered in Europe in the last hundred years than in the preceding two thousand years. We experienced here the worst tragedy of our history. Here we dreamed an impossible rebirth. Six million, a third of our people, were murdered here by starvation, gas, rifles and fire. What remains from them is ashes. We shall not forget that the righteous among the nations carried candles of light in the darkness. They were small in number but great in heroism. Israel was born from the ashes at the end of the Second World War. If someone had stood up then and said that within three years a Jewish state would be created – he would have been considered a delirious visionary. But the dream became a reality. And if somebody would have stood up on that very day, and said that in six short years a new united Europe would be born, with borders erased, barriers lowered, he would have been considered an author of fiction. Six countries signed the Treaty of Paris and became a community of 27 nations across Europe. Our relations here and now are a dialogue between two miracles. Israel enjoys an Association Agreement with Europe, and close ties with the European Union in nearly all fields. I have come to thank you for your friendship, based on common values, geographic proximity and a long history. Politically – Israel is a Western democracy with a Mediterranean experience. Religiously – Israel is the cradle of the three great monotheistic religions. Scientifically – Israel is advanced, even by European standards. Israel is small: One pro mil of the Middle Eastern area. Its soil is barren rather than fertile. A typically Middle Eastern soil. Water is sparse. We have two lakes, one is dead, the other is dying. We have a single river – the Jordan – rich in history, poor in water. The land is rich in archeology and poor in natural resources. The only natural resource we discovered is the human potential. Israel is an example where the people enriched the land more than the land enriched the people. It is an example where the devotion of people and merits of hi-tech forced deserts to surrender. To flourish. We went through seven wars. We won them. But when peace became possible, we returned all the land and assets which we won at war to Egypt and Jordan. We started a peace process with the Palestinians which enabled to build a Palestinian Authority. Then, we evacuated the Gaza Strip. We dismantled 22 settlements and brought back home all the settlers. The Palestinians could have used the Strip to build an independent entity. Unfortunately, they turned it into a terrorist base instead. It became a setback to the peace process. Israel is an island in a stormy ocean. We have to defend our island. And we are interested in the tranquilization of the sea. Some people claim it will take generations. Europe has proved that great events can be achieved in six years. We live in a new era where events are moving at the speed of a plane and no longer at the speed of a carriage. For that reason, I believe that peace can be achieved in a short while. The peace process with the Palestinians already has an agreed beginning and an agreed solution. Two states for two nations. An Arab state – Palestine. A Jewish state – Israel – living in peace, security and economic cooperation. The remaining disputed issues can and should be negotiated. Peace for Israel is not just a strategic choice. It is a moral call which stems from the depth of our heritage. Since the Exodus, our heritage condemns slavery and rejects mastery, as all persons were born equal. Our legacy calls upon us to pursue peace. Together with my partner Yitzhak Rabin, we laid down the foundations for peace with the Palestinians. Now it is time to continue. To renew the peace process. We must continue to work with the Palestinian Authority. Support its economy. Achieve peace. A Palestinian security force was formed. You and the Americans trained it. And now we work together to prevent terror and crime. Our hand remains stretched out in peace to all the countries in the Middle East. In a short while, a new Israeli government will be formed. It is an occasion to resume peace negotiations. To realize the two-state solution. There is no other solution. It is not only our preference but the call of the present reality. Jordan, Israel and Palestine, find themselves in a similar situation. Terror endangers each of them separately and the three of them collectively. Collective dangers call for collective security. I have the highest regard for the King of Jordan. Like his father, he has proved to be courageously committed to peace. I have known the president of the Palestinian Authority Mahmud Abbas for many years. He condemns terror and is a real partner for peace. Europe has been and continues to be a major partner for peace and against terror. Next week, we will be hosting President Obama in Israel as a welcome and esteemed guest. His support for our security is extraordinary and his devotion to peace is unshakeable. We are glad that the United States and Europe are now working together, supporting peace and rejecting terror. The greatest danger to peace in the world is the present Iranian Regime. It became a dictatorship cloaked in a religious mantle. It developed an imperial appetite. Nobody threatens Iran. Iran threatens others. It endangers the independence of Arab countries. It menaces the mere existence of Israel. It smuggles arms into many countries in order to undermine their stability. They deny the Holocaust. They call for another Holocaust. They are aiming to build a nuclear weapon and they deny it. A nuclear bomb in the hands of an irresponsible regime is an imminent danger to the world. The European Union and the United States drew the conclusions and together created a policy to stop this danger. To this end, you rightly decided to impose economic sanctions. You made it clear that if the Iranians will not respond, other options are on the table. In addition to the nuclear bomb, Iran is constructing long-range missiles equipped with nuclear warheads. It can reach the far corners of the world, including Europe. I believe that in addition to controlling the production of highly enriched uranium – there is a need to control the means of delivery. To control the production of missiles capable of carrying nuclear warheads. Khamenei declared that religion prohibits the production and use of nuclear arms. Why then does he build missiles capable of carrying nuclear warheads? During the Helsinki conference which took place in 1975, the U.S.A. placed the issue of human rights in the Soviet Union at the top of the world’s agenda. It was surprising and effective. It shows that the moral voice is no less important than a diplomatic demarche. Today, this call should apply to Iran. A clear voice must be raised against the violation of human rights by the Iranian regime. A clear voice must be raised against a regime that hangs people without bringing them to court, that throws journalists into prison without trial. That fires live bullets at civilian demonstrators, without respect for their lives. A clear voice must be raised against a regime that discriminates against women. And instead of sharing the oil-generated profits with their own people, they spend them on terror and arms to endanger people all over the world. Enriched uranium impoverishes hungry children. A moral voice will encourage the Iranian people in their fight for freedom, in their struggle against misery. Very soon, elections will take place in Iran. The Ayatollahs should not be allowed to falsify the results. To frustrate the right of the people to make their own free choice. Your voice will show the Iranian people that the world has not turned its back on them.The present leaders of Iran are violating the charter of the United Nations which condemns the violation of human rights and aggression against other nations. Yet they are given the opportunity in the United Nations to abuse its platforms. Iran supports terrorism throughout the world. Its main proxy, Hezbollah, carries out terror attacks and threatens the stability of the entire region. The historic Sykes–Picot agreement between France and England, gave birth to modern Lebanon to be a multi-cultural country where Muslims, Christians and Druze live together in peace. Today, Hezbollah, supported by Iran, is destroying Lebanon. Hezbollah is a terror organization. Not a political movement. They collect missiles. They are trigger-happy. They hide missiles in peaceful towns and villages. By doing so, they turn them into a war target. Hezbollah divided Lebanon politically, religiously and ethnically. It turned the land of the cedar tree into a scorched and barren land. Hezbollah is a state within a state. A private army apart from the national army. It sends soldiers to support the massacre of a bloody dictator in Syria. With no authorization of the government of which it is a member. Recently, 20 terror attempts by Hezbollah were counted all over the world, in India, Thailand, Georgia, South Africa, the U.S.A., Egypt and Greece, among others. Last month, the government of Bulgaria, a member of this European Union, reported that it had identified that the terror attack in Burgas, was carried out by Hezbollah. Five Israeli tourists and one Bulgarian citizen lost their lives. Cyprus recently arrested a Hezbollah terrorist planning a terror attack. Your voice is highly respected. We appeal to you – call terror – terror. Save Lebanon from terrorist madness. Save the Syrian people from Iran’s proxies. Save your citizens and ours from Hezbollah. The international community must designate Hezbollah as a terrorist organization. Today, terror’s extent reaches far beyond its previous limitations. Recently, terrorists attempted to take over Mali. Were they to succeed, it would have halted the impressive endeavor of the African continent to recover from its past. One of the highest hopes for all of us is to see the brave attempt of the African people to build a new science-based economy. The free world cannot stand by as terror imposes its grip onto any part of the world, far or near. It cannot stand by when a massacre is carried out by the Syrian president against his own people and his own children. It breaks all our hearts. Assad secretly built a nuclear installation and an arsenal of chemical weapons. While the nuclear installation was destroyed in time, the chemical arms remain in his hands to this very day. This terrible danger threatens the Syrian people, the entire region and even Europe. A solution must be found to prevent the chemical weapons from falling into the wrong hands. The best solution to put an end to the Syrian tragedy might be achieved by empowering the Arab League, of which Syria is a member, to intervene. The intervention of Western forces would be perceived as a foreign interference. The Arab League can and should form a provisional government in Syria to stop the massacre, to prevent Syria from falling to pieces. The United Nations should support an Arab force in blue helmets. Dear friends, 18 years ago I came to Brussels to sign the Association Agreement between the European Union and Israel. I am happy that reality has surpassed my expectations. Indeed, the association agreement became a partnership. And before long, the partnership became a friendship. 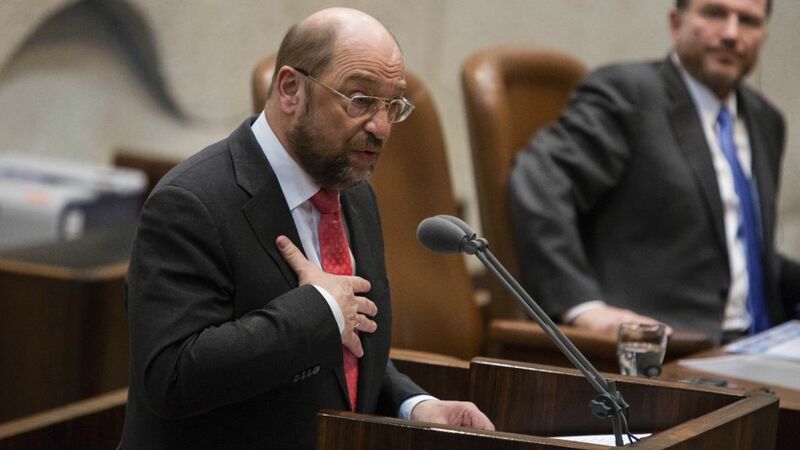 It is on these steady grounds that I propose to the European Union and Israel to cooperate for the benefit of stability and prosperity in the Middle East, and the developing world at large. Israel is described as a Start-Up Nation. I believe that the whole Middle East can become a Start-Up region. Hi-tech incubators can be created all over the region to escape poverty. Israel is small. So we try to take advantage of our smallness. We discovered that small countries can become great pilot plans. Today, we are trying to build a social model that will bridge the gap between the have and have-nots. The social gap is a major problem for all of us, rich and poor. We are looking for new ways to overcome this gap by democratizing health, education, communication and by reducing the cost of food and housing. This is a burning need for the young generation. We intend to improve the human condition. To enable each person to possess the capacity of making a free choice for their way of life, by entering the secrets of our brains. The brain is the most illustrious instrument of the world. It has enabled us to build artificial brains. Yet we are still far from understanding the way it functions. We are strangers to ourselves. Discovering the mechanism of our brain will enable us to become friendly with ourselves and our fellow men. I am glad that this effort gained a new priority and became a major topic for cooperation between our governments, non-governmental organizations, and between us as individuals. Our global world has no global government. It has become almost ungovernable. We have to look for an alternative.I believe the future ways of governing shall rely on three pillars: National governments will continue to be in charge of the husbandry of the national state. Global companies will invest in research and development. And the individual will enjoy the capacity to govern themselves by knowing the way their brain functions. Science today is more telling than politics. It is universal and borderless. Armies cannot conquer wisdom. Police cannot arrest science. I believe that scientific aid to developing countries can enable them to escape poverty. Science-based global companies can help change the world. Globalization put an end to racism. It empowers the individual. Global companies do not impose their will upon people. On the contrary, they respect the will of their clients. They can provide scientific know-how for growth. They can assist young people to acquire high education. To create jobs befitting their skills. This may be the best help we can offer to the young generation in the Arab world to answer the challenges of the new age. I proposed a plan for a joint venture for the European Union between national governments and global corporations in order to cope with these challenges. Ladies and Gentlemen, I know it requires your support as the European Parliament. But allow me to count on your help. 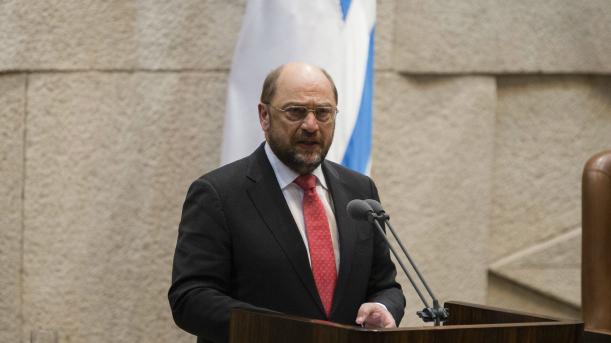 Joining Europe’s wisdom and Israel’s experience, we can overcome tomorrow’s challenges. Facing the lack of global governance, we can foster close cooperation between governments and global companies. Facing the dangers which threaten the values for which we stand, we shall fight terror wherever it is, relentlessly. The time has come to do. Let us remember that we are only ever as great as the purpose we serve. Yes, the challenges ahead of us are daunting But who better to defy the seemingly impossible than two miracles? Let us join forces, the European Union and Israel. To fulfill the teachings of our heritage. In the words of my forefathers, let us fix the world – Tikkun Olam. In the words of Jean Monnet – let us do. Let us work together for a better Middle East, for a forward-thinking Europe. Let us fulfill our values of peace, democracy, human rights. Yielding at no obstacle. Daring the new. We shall be servants of the future rather than rulers of the past. As I look upon the future of the friendship which ties Israel to the European Union, I am filled with hope and determination. Hand in hand, we shall build a brighter tomorrow for tomorrow’s generation. After his meetings this week with European Union leaders in Brussels and with French President Francois Hollande in Paris on Friday, Israeli President Shimon Peres will conclude his visit to the EU with a foreign policy address to the plenary session of the 754-member European Parliament next Tuesday in Strasbourg, France. “I look forward to our annual meeting, it’s always good to meet, but these are auspicious times. I first want to congratulate the EU for receiving the Nobel Peace Prize. Would that we could replicate in the Middle East what was achieved in Europe. That is, decades of stability and peace and tranquility. That is our goal and we’ll discuss how we can advance that goal, that all Israelis share fervently. PM Netanyahu meets U.S. Senator Joe Lieberman, warns against Iran using talks to further advance its nuclear program. Prime Minister Binyamin Netanyahu addressed on Sunday the latest round of talks between Iran and six world powers, which were held in Turkey over the weekend. Netanyahu, who met with U.S. Senator (ID-CT) Joe Lieberman, warned against Iran using the opportunity to advance its nuclear weapons program. On Saturday, the European Union’s foreign policy chief, Catherine Ashton, said the talks have been constructive and that the sides will meet again in Baghdad on May 23. Last week, U.S. Secretary of State Hillary Clinton said it was now “urgent” for Iran to ease concerns over its nuclear program. “We believe there is still time for diplomacy, but it is urgent that the Iranians come to the table to establish an environment conducive to achieving concrete results through a sustained process,” Clinton said.